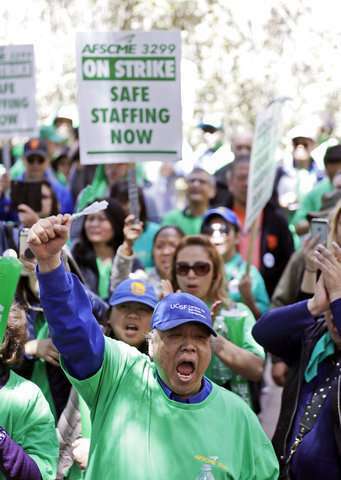 Tens of thousands of University of California nurses, pharmacists and radiologists joined a three-day strike Tuesday in support of university service workers who are demanding higher wages. 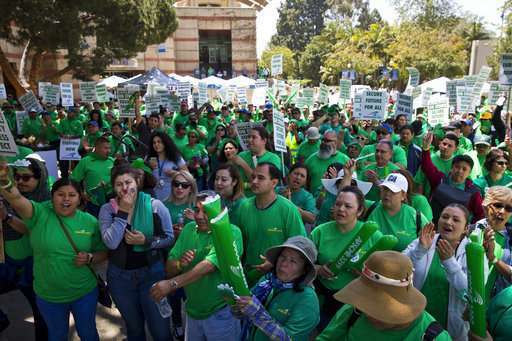 Workers dressed in bright green T-shirts banged drums as they picketed for a second day outside the university system's 10 campuses and five medical centers. 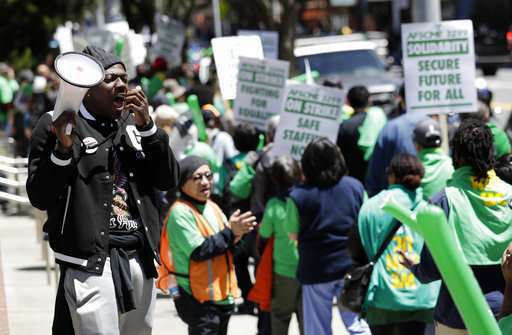 The 29,000 medical workers heeded a call by custodians, cafeteria workers and gardeners for a sympathy strike and plan to join them again on Wednesday. "Nurses at UCLA are standing strong with our sisters and brother co-workers," said UCLA nurse Marcia Santini. "We demand that UC show them the respect they deserve for the hard work that they do every day." Medical center officials said they would continue to deliver essential patient care services, but hundreds of surgeries and thousands of appointments have been rescheduled in anticipation of the strike. 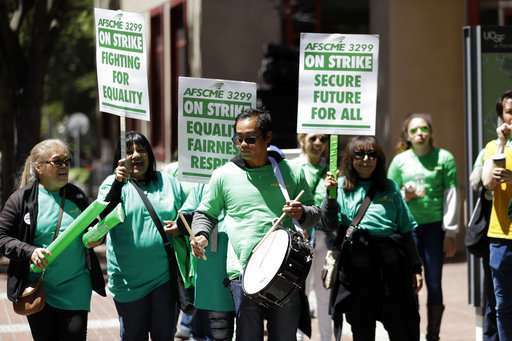 American Federation of State, County and Municipal Employees Local 3299, which represents 25,000 workers, called the strike last week when the union and the university could not agree on a new contract after negotiating for more than a year. The union wants the university to stop outsourcing low-wage work and address what it describes as widening income, racial and gender gaps for service workers, said Todd Stenhouse, a spokesman for ASFCME Local 3299. The average striking worker earns $40,000 a year and can't keep up with California's rising cost of living, Stenhouse added. University officials have said service workers are already paid at or above market rates and that it cannot afford the nearly 20 percent pay raise over three years the unions is demanding. U.S. Senator Kamala Harris has canceled plans to deliver the commencement speech at UC Berkeley in support of the striking workers. Harris said in a tweet that she "regretfully" won't attend Saturday's spring commencement due to the labor dispute and the call for a university-wide speaker boycott.